Chavin de Huantar is an archaeological site containing ruins and artifacts constructed beginning at least by 1200 BCE and occupied by later cultures until around 400-500 BCE by the Chavin, a major pre-Inca culture. The site is located 250 kilometers (160 mi) north of Lima, Peru, at an elevation of 3,180 meters (10,430 ft), east of the Cordillera Blanca at the start of the Conchucos Valley. Chavin de Huantar has been designated a UNESCO World Heritage Site. Some of the Chavin relics from this archaeological site are on display in the Museo de la Nacion in Lima and the Museo Nacional de Chavin in Chavin itself. Occupation at Chavin de Huantar has been carbon dated to at least 3000 BCE, with ceremonial center activity occurring primarily toward the end of the second millennium, and through the middle of the first millennium BCE. While the fairly large population was based on an agricultural economy, the city's location at the headwaters of the Maranon River, between the coast and the jungle, made it an ideal location for the dissemination and collection of both ideas and material goods. This archeological site is a large ceremonial center that has revealed a great deal about the Chavin culture. Chavin de Huantar served as a gathering place for people of the region to come together and worship.The transformation of the center into a valley-dominating monument had a complex effect; it became a pan-regional place of importance. People went to Chavin de Huantar as a center: to attend and participate in rituals, consult an oracle, or enter a cult. Findings at Chavin de Huantar indicate that social instability and upheaval began to occur between 500 and 300 BCE, at the same time that the larger Chavin civilization began to decline. Large ceremonial sites were abandoned, some unfinished, and were replaced by villages and agricultural land. 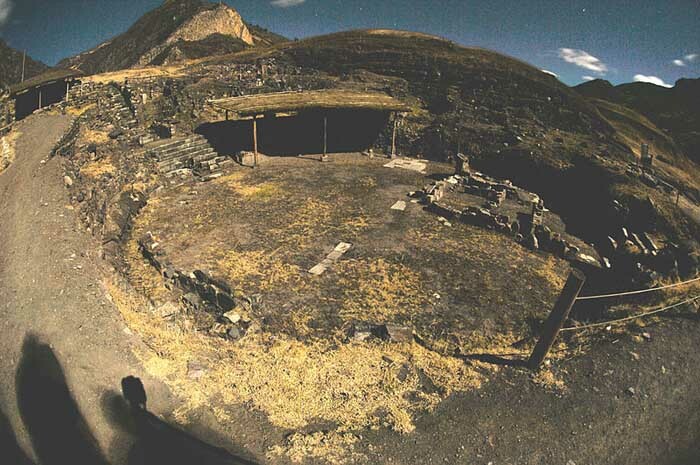 At Chavin de Huantar, no later than 500 BCE, a small village replaced the Circular Plaza. 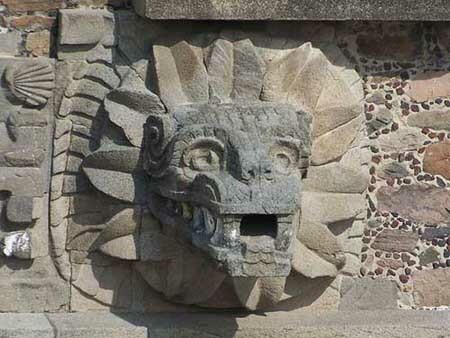 The plaza was occupied by a succession of cultural groups, and residents salvaged building stones and stone carvings to use in house walls. Multiple occupation floors indicate the village was continuously occupied through the 1940s. 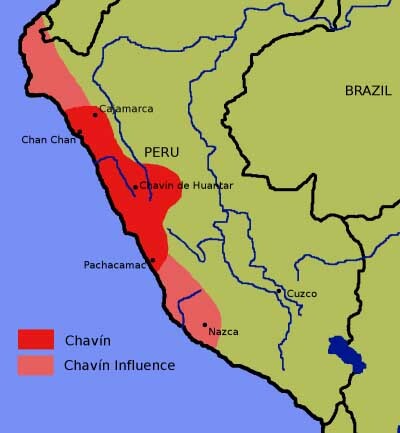 The Chavin civilization was centered on the site of Chavin de Huantar, the religious center of the Chavin people and the capital of the Chavin culture. The temple is a massive flat-topped pyramid surrounded by lower platforms. It is a U-shaped plaza with a sunken circular court in the center. The inside of the temple walls are decorated with sculptures and carvings. Chavin de Huantar was constructed over many stages starting prior to 1200 BCE, with most major construction over by 750 BCE. The site continued in use as a ceremonial center until around 500 BCE, but prior to 400 BCE its primary religious function had ceased, and the site was occupied by casual residents of the highly distinct cultural tradition, Huaraz. During its heyday, Chavin de Hunatar was used as a religious center for ceremonies and events, perhaps a home for an oracle. 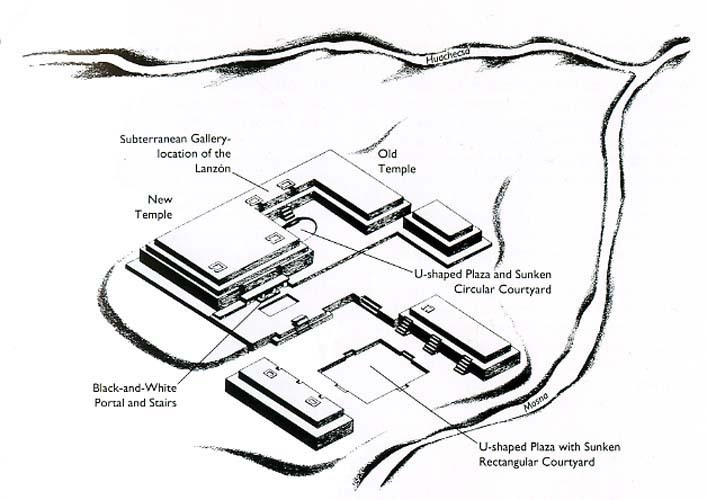 The site contains a number of major structures, including Temples A, B, C and D, and areas and buildings designated as the Major Plaza, the Circular Plaza, the Old Temple and New Temple, although the latter two designations are no longer accurate in light of recent research advances. Circular Plaza appears to have been a sacred and ritually important open-air space within a ceremonial center. Prior to 800-700 BC, this location had a number of functions, including serving as an atrium for entering Temple A through the temple's north staircase. The plaza in the classic period, after 700 BC, is bounded on three sides by major Temples A, B, and C. The plaza is perfectly circular and is close to 20 meters (66 ft) in diameter, with a floor consisted of pillow-shaped pavers of yellow diatomite. It appears that a center line of black limestone blocks runs on its architectural east-west axis. Walls of the plaza were constructed of cut stone, principally granite, laid in courses of varying width. The two broadest courses were carved in arcs closest to the western staircase and in two pairs of terminal stones flanking the eastern staircase. The Old Temple, constructed early in the site's history, was an inward-facing structure composed primarily of passageways built around a circular courtyard. The structure contained obelisks and stone monuments with relief carvings depicting jaguars, caimans, and other forms with anthropomorphic features. The Lanzon Gallery, located at the very center, contained a sculpture of the Lanzon, which is assumed to be a supreme deity of Chavin de Huantar. The figure is anthropomorphic, with a feline head and human body. Mortars, pestles, conch-shell trumpets, and many other items have also been found. Many of these artifacts have an anthropomorphic design or decoration and are thought to be associated with Chavin rituals. The architectural design of Chavin de Huantar changed over time as a new temple was added to the old temple. The New Temple, constructed between 500 and 200 BC, is also based on a gallery and plaza design and contained many relief sculptures. The Lanzon deity is also present, holding a strombus shell in the right hand while the left hand holds a Spondylus shell. Changes were more complex than in one stage of renovation. Smaller renovations happened consistently over the Chavin horizon ending by about 500 BCE when the new temple was completed. With the simpler design of the old temple, Chavin de Huantar followed the U-shaped ceremonial center design accompanied by a sunken circular plaza. After the new temple was complete, Chavin de Huantar still embodied a U-shaped ceremonial center design. The renovations enlarged the site considerably and added a larger sunken rectangular plaza. The main objective of the renovations appears to be based on enabling more people to gather in one place, as the site in general expanded. Excavation of burial sites gave evidence of a small elite class whose tombs contained elaborate burial goods, consisting of precious metals, colorful textiles, and other valuables. Most burials were simpler, with bodies interred in shallow pits with cotton clothing and a simple tool kit. Local style in art and decoration included scrolls, simple curves, straight lines, and images of wild animals. Chavin sculpture is usually of white granite and black limestone. Carved stone mortars and pestles, conch-shell trumpets, bone tubes and spatulas, and metal spatulas and spoons were found decorated in Chavin style as were various textiles including tapestries. Pottery was found in a wide variety of forms, including bottles and bowls, decorated with a wider range of distinctive elements. This site holds a large amount of geographical and religious significance which may be one of the reasons why the location was used as a large ceremonial center and a center of power for the Chavin culture. Chavin de Huantar is located north of modern day Lima at the merging of two rivers: the Mosna river and the Huanchecsa river. As a result this site allows for easy transportation and, at the same time, limited access to outsiders. Chavin de Huantar itself is located on a lowland valley where the two rivers merge and high altitude valleys are located nearby. Consequently, the people at Chavin de Huantar were able to cultivate lowland crops such as maize and high altitude crops such as potatoes. The people were also domesticating llamas in the high altitude areas for food and as a means to carrying heavy loads on the steep slopes of the hills. The religious significance of Chavin de Huantar depends upon the geography of the site. The merging of two large rivers has shown religious significance in past cultures, and thus it makes sense that the location of Chavin de Huantar was utilized as a religious ceremonial center. The convergence of two rivers is referred to as tinkuy, which can be defined as the harmonious meeting of opposing forces. It has been suggested that Chavin de Huantar served as the meeting place of the natural and cosmic forces The area is known to have natural hot springs as well as an awe-inspiring view of the Huantsan peak which could both add to religious significance of the site. The Lanzon is the colloquial name for the most important statue of the central deity of the ancient Chavin culture of the central highlands of Peru. The Chavin religion was the first major religious and cultural movement in the Andes mountains, flourishing between 900 and 200 BCE. The Lanzon takes its name from the Spanish word for "lance," an allusion to the shape of the sculpture. The Lanzon is housed in the central cruciform chamber of a labyrinthine series of underground passages in the Old Temple of the ceremonial and religious center of Chavin de Huantar. Devotees would be led into the maze of pitch-black tunnels, eventually coming face to face with the sculpture's snarling mouth and upturned eyes. The worshipers' disorientation, in addition to the hallucinogenic effects of the San Pedro cactus they were given before entering, only heightened the visual and psychological impact of the sculpture. The central image of the Lanzon functions as axis mundi, or pivot linking the heavens, earth and underworld. Position within the building also suggests centrality of image. 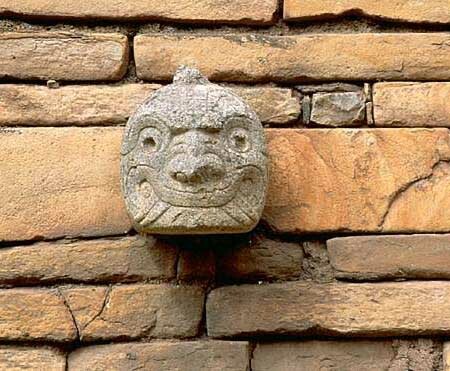 The Lanzon has been interpreted variously as a principal deity of Chavin, an oracle with the power to speak (thanks to a hole in the roof of the chamber), a symbol of trade, fertility, dualism, and humankind's interaction with nature, or any combination of these. What is evident is that the 4.5m (15 feet)-tall obelisk is a painstakingly carved piece of white granite in a roughly lance-like shape, and depicts a human-feline hybrid with claws, writhing snakes for hair and eyebrows, fangs curved sideways in a smile (thus the nickname 'Smiling God'), and one arm raised while the other is lowered. Other carvings at Chavin de Huantar depict Lanzon clutching a Strombus shell in one hand and a Spondylus shell in the other, which has been interpreted as a possible reference to fertility and the duality of the sexes. The monuments of Chavin are located in the middle of the White Cordillere at 3185 meters which is formed by the Huachecsa and Mosna Rivers. Local legend says the ancient ruins were formed by giants who today we call Ancient Aliens - those who visited planet Earth throughout its history. Does the article below reference Ancient Alien visitors? Rods of the Gods as advanced technology? Biogenetic experiments? Even the lonely monuments left behind have a story to tell. Chavin de Huantar, in the Peruvian Andes, is one of many civilizations to have preceded the mighty Inca empire. The occupants of the ruins have no name; lacking a script, their cultural identity is forever buried in the sands of time. Hard by the entrance to the site, the visitor is greeted by the so-called Raymondi Stela, named after the Italian geographer and natural historian Antonio Raimondi (1826-1890), who discovered it in a peasant's hut in Callejon de Conchucos in 1874. Those unable or unwilling to journey this far can inspect a faithful replica in Lima's Museo Nacional de Arqueologia. Devoid of any helpful caption, such as ancient Egyptian and Mesopotamian artists would frequently provide, the image carved into the granite surface startles the observer. What on earth is here depicted? The anthropomorphic being at the base will undoubtedly have represented a conspicuous deity or ancestor in the pantheon of the Chavin people � if not the principal object of worship at the adjacent temple. The two staffs held by this being, one in each hand, identify it as the dios de los varas or god of the rods familiar from various other cultures throughout Peru. And the serpentine locks of hair attached to the head are a common feature of the same entity. Unparalleled, by contrast, is the god's towering headdress, composed of three stacked heads, nine superimposed tentacles on each side, and a minor structure on top crowned by a pair of intertwined serpents. It's a baffling scene, defeating scholars' best attempts to propose a suitable prototype in the familiar world of nature. 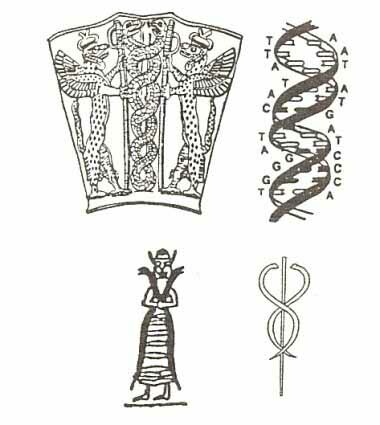 Nor do comparisons with Medusa's ophidian hair, Hermes' caduceus or the two snakes held in the outstretched hands of Herakles or a Cretan goddess shed much further light; all are legitimate, but are as mysterious themselves as the image at hand. A solution comes from an entirely unexpected source - the study of laboratory plasmas. Research less than a few decades old has uncovered what may well be the only plausible prototype for the Chavin deity in all of nature: a plasma z-pinch subject to sausage, vortical and other, nonlinear instabilities. A plasma beam pinched tightly will eventually break up into a stack of toroids, typically 9 in number. An increase in electrical current with a slow rise time pushes the evolution of the column into a chaotic regime, which sees the toroids joined by a central bar before flattening, extending outward like the branches of a tree, and curling up at the ends. The American plasma physicist Anthony Peratt proposed that such a high-energy density formation materialized in visible light in the earth's upper atmosphere prior to the dawn of civilization. The cause of this 'enhanced aurora' was a dramatically increased influx of charged particles into the earth's magnetosphere - most likely from the sun. A speculative hypothesis it is, but one rooted in a base of solid experimental work and sound reasoning, sprouting tendrils into many a scholarly discipline. 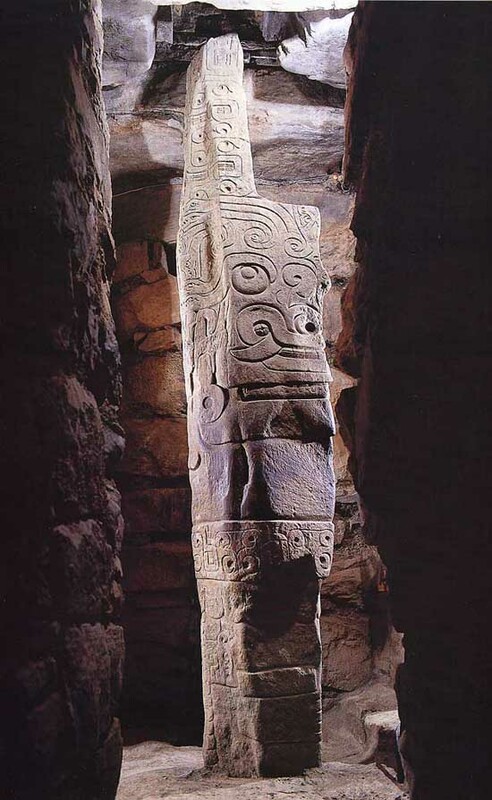 Did the deity of Chavin de Huantar owe its perplexing countenance to a giant atmospheric plasma tube, carved in granite? 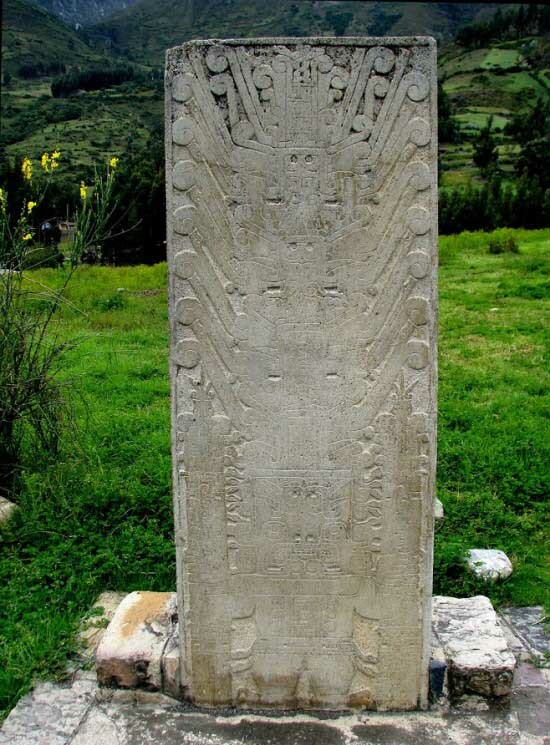 In the absence of any explicit indigenous commentary, such as a written note or a surviving oral tradition among local Quechua descendants, this will remain thought-provoking, but unverifiable guesswork - the stele cannot stand on its own. Yet if the reality of such a prehistoric near-earth plasma column is established on account of other, more definitive sources, the iconography of the pre-Incan rods god does furnish circumstantial evidence. At least in this sense, even mute artifacts transform into a welcome repository of information. The layered heads and arms come to life on a theory of layered evidence. The largest Pre-Columbian city in South America, Chan Chan is an archaeological site located in the Peruvian region of La Libertad, five km west of Trujillo. Chan Chan covers an area of approximately 20 km sq. and had a dense urban center of about 6 km sq. 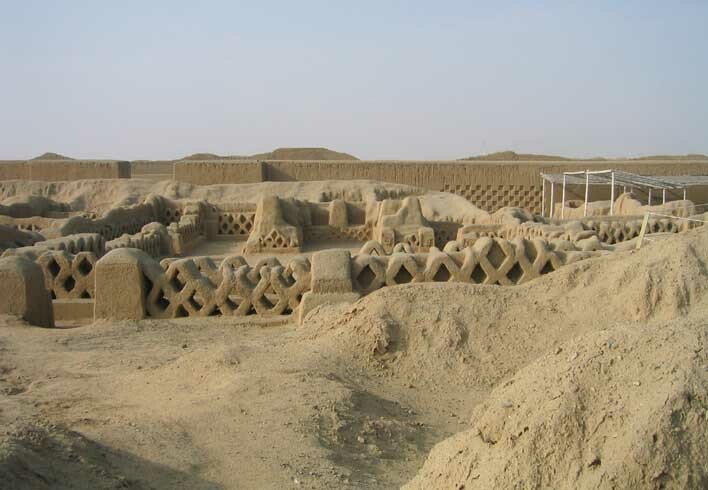 Chan Chan was constructed by the Chimor (the kingdom of the Chimu), a late intermediate period civilization which grew out of the remnants of the Moche civilization. The vast adobe city of Chan Chan was built by the Chimu around AD 850 and lasted until its conquest by the Inca Empire in AD 1470. It was the imperial capital of the Chimor until it was conquered in the 15th century. It is estimated that around 30,000 people lived in the city of Chan Chan. Chan Chan was added as a UNESCO World Heritage Site in 1986. The city is severely threatened by storms from El Nino, which cause heavy rains and flooding on the Peruvian coast. It is in a fertile, well-watered section of the coastal plain The city's ruins are additionally threatened by earthquakes and looters. Present-day visitors to Chan Chan can enter the Tschudi Complex, believed to be one of the later citadels built in the city. There are also several other Chimu and Moche ruins in the area around Trujillo. This site was discovered by the Conquistador Francisco Pizarro.